Can you confirm these amateur observations of Laticauda colubrina? Possibly introduced to the Mediterranean Sea (Korfu). Synonymy partly after COGGER 1983 and PETERS & OREJAS-MIRANDA 1970, and HEATWOLE et al 2005. SHINE et al. 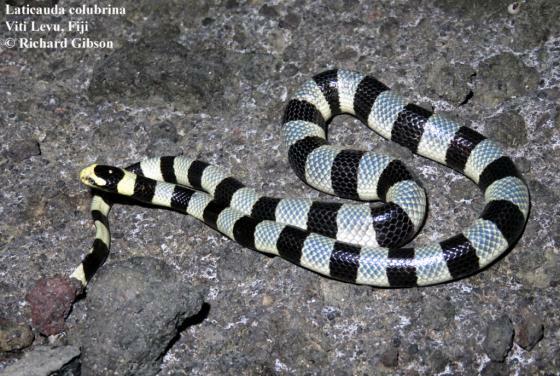 (2002) show that L. colubrina and L. frontalis are sibling species that are reproductively isolated. 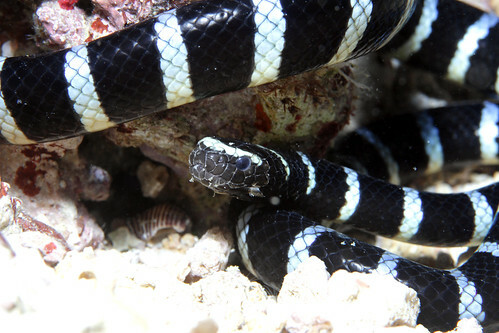 Distribution: The sea krait Laticauda colubrina is the most widespread member of its genus, extending from the Bay of Bengal through much of Asia and the Indo-Malayan Archipelago to New Guinea and many islands of the western Pacific Ocean. Steinicke & Trutnau (1993), later cited by TOTH et al. (2002), reported a sighting of this species on the coast of Corfu (a Greek island!). See map in Gherghel et al. 2016 and Heatwole et al. 2017. 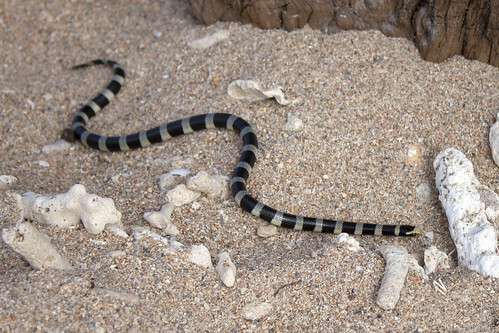 Laticauda frontalis (de Vis, 1905) is a dwarf species found in sympatry and syntopy with Laticauda colubrina in Vanuatu and the Loyalty Islands of New Caledonia. Caras, R. 1974. Venomous Animals of the World. Prentice Hall, 362 pp. Kharin, V.E. 2008. Biota of the Russian Waters of the Sea of Japan Vol. 7 - Reptilians [in English and Russian]. Vladivostok, Dalnauka, 170 pp. Villa,J. 1984. 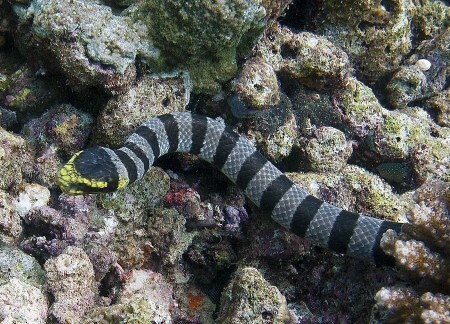 The venomous snakes of Nicaragua. Milwaukee Publ. Mus. Contrib. Biol. & Geol. No. 59, 41 pp.